The temperature dependence of the rate of chemical reactions and biological processes is frequently described by the Arrhenius equation. A recently introduced alternative in food research is the Eyring–Polanyi model, adapted from chemical kinetics. It is shown here that there are many conditions in which data generated with a simpler exponential model can be fitted with the Eyring–Polanyi model and vice versa. This suggests that an Eyring–Polanyi model is not sufficient to definitively establish the existence of a temperature-independent "free energy of activation" in food processes and reactions unless the presence of an activated state can be confirmed independently. This Demonstration computes versus datasets using the Eyring–Polanyi or related equations that are fitted with an exponential model. It also generates such datasets using the exponential model that are fitted by the Eyring–Polanyi model or a related equation. 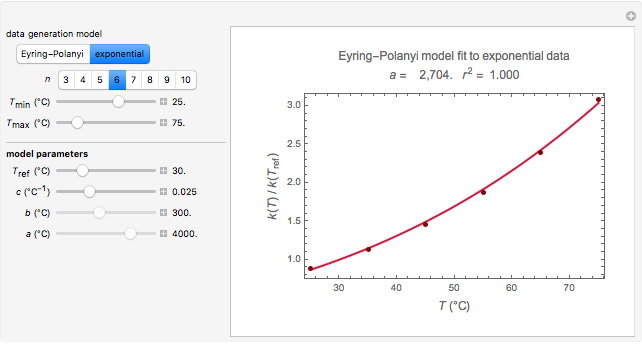 The Eyring–Polanyi-like equation is presented as , where and are the rates at temperature and the reference temperature, , respectively, both in °C, and and are constants having temperature dimension. Notice that setting to 273.16 °C produces the standard Eyring–Polanyi equation. 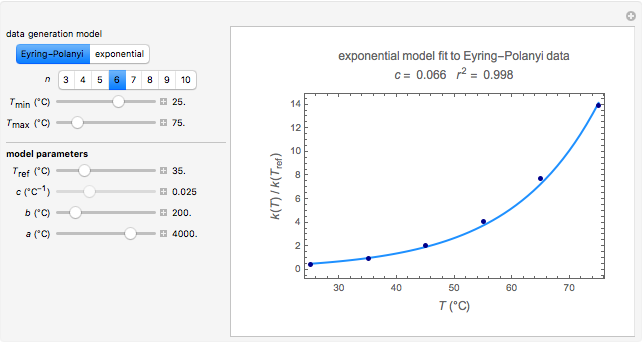 The exponential model equation is , where is a constant having temperature reciprocal units . Choose the data generation model by clicking the setter bar. The data so generated will be fitted by the other model. Use the sliders to enter the number of points , the plot's temperature range and , the reference temperature , and the generation or fit parameters , , and . The display shows either the versus data generated with the original or modified Eyring–Polanyi model and their fit by the exponential model, or the versus data generated with the exponential model and their fit by the original or modified Eyring–Polanyi model. When the parameter is large, the modified Eyring–Polanyi plot of the data generated by the exponential model is nearly linear. C. S. Barsa, M. D. Normand, and M. Peleg, "On Models of the Temperature Effect on the Rate of Chemical Reactions and Biological Processes in Foods," Food Engineering Reviews, 4(4), 2012 pp. 191–202. doi:10.1007/s12393-012-9056-x. Mark D. Normand, Christina S. Barsa, and Micha Peleg "Eyring-Polanyi versus Exponential Model for Chemical Reactions"